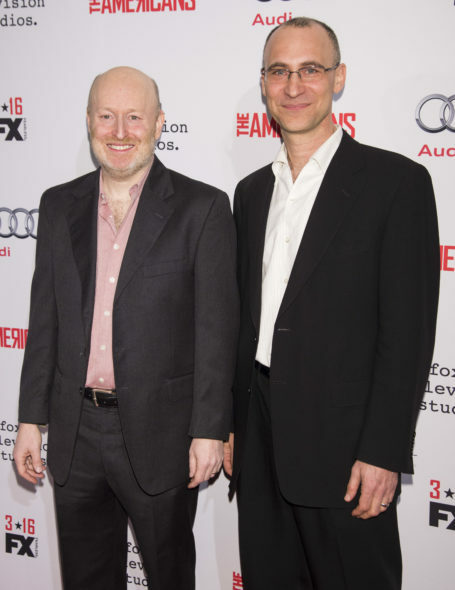 The Americans TV showrunners Joe Weisberg (left) and Joel Fields. Photo by Scott Gries/FX Networks. Below, watch The Americans TV series showrunners, Joe Weisberg and Joel Fields — who “cancelled” their own show — “spoil” the end of the spy drama series — two seasons in advance. As previously announced, after talks with Weisberg and Fields, FX renewed The Americans for a fifth season of 13 episodes and a sixth and final season of ten episodes. The executive producers already had network assurance that the series would only end for creative reasons. Following in the footsteps of Lost‘s Damon Lindelof and Carlton Cuse, they determined how much story they had left to tell, how long it would take to tell it, and agreed on an end date with FX. Now the duo have confessed they know how The Americans, starring Keri Russell and Matthew Rhys as KGB spies, will end — more or less. Weisberg says they have four ideas for how the show ends, “…but the trick is, they’re all the same idea.” Fields then clarifies those four ideas are variations on a theme. Fields says one of the fun things about The Americans is that they get fixed ideas about how a story will break, and that is how it breaks during the writing process, about 2/3rds of the time. During the other 1/3rd, the stories surprise them. Watch Weisberg and Fields tease The Americans TV series finale. Last night’s “Dinner for Seven,” positions the chess pieces. Pastor Tim (Kelly AuCoin) and his wife Alice (Suzy Jane Hunt) meet Stan Beeman (Noah Emmerich) at the Jennings’ house and learn their Russian spy hosts are buddy-buddy with their FBI agent neighbor. Meanwhile, Stan tells Philip that Frank Gaad (Richard Thomas) was killed on his trip to Thailand, and he believes the KGB got him. Later, Philip reminds Elizabeth that Stan told him about Gaad’s vacation. Philip included the information in his report. At the office, Agent Dennis Aderholt (Brandon J. Dirden) tells Stan that when Gaad broke the mail robot and it was sent out to be serviced, there was a 9-1-1 call from the repair facility about a death assumed to have been due to natural causes. Also, Stan “broke up” his bromance with Oleg (Costa Ronin) after baring his soul not only about Gaad, but his own reaction to Chris Amador’s (Maximiliano Hernández) death. A disguised Philip, Gabriel (Frank Langella), and a middle-aged female tech expert (The Leftovers‘ Marceline Hugot) tell Don (Rob Yang) that Patty (aka Elizabeth) killed herself over his insistence that she abort her (fake) pregnancy. They demand money to fly her body back to wherever and bury it. It is all a ruse to get Don out of his office, so Gabriel and No-Name can rifle through it for the Level Four codes, which they don’t find. No-Name does manage to copy all Don’s files. The codes may be in there. When Elizabeth isn’t buttering up Tim and Alice, or filled with regret, while listening to a tearful message from Young Hee (Ruthie Ann Miles), she’s picking up Paige from her volunteer gig at a food pantry. When mother and daughter are accosted by would-be muggers who take their cash and a shine to Paige, Elizabeth fights off the younger assailant. The older one makes the fatal error of pulling a knife on Mama Bear. Elizabeth struggles with him and ultimately kills him as a horrified Paige looks on. Revisiting Fields and Weisberg’s chat above, it seems as though this series can only end in one way: Philip and Elizabeth end their careers as KGB spies. As the showrunners hinted it, there seem to be four ways to accomplish that: Stan arrests Elizabeth and Philip; The Jennings defect; the couple are killed; the family is exfiltrated to the USSR. No wonder Weisberg and Fields are prepared to end The Americans after two more seasons. It feels past its midpoint. That is no critique of quality. It is an assessment of the progress of the series. Everything has changed. This crescendo cannot continue much longer. Bring on the final conflict and denouement. What do you think? Do you agree it feels like The Americans TV show is building toward its natural conclusion? How do you think The Americans TV series finale should play out? What do you want to happen?